For homeowners who are looking for a way to enhance your yard, you may want to think about installing a retaining wall. They look great and will add value to your home. In addition, the wall will give your yard a dramatic appeal and will enhance the overall appearance of your yard and home. 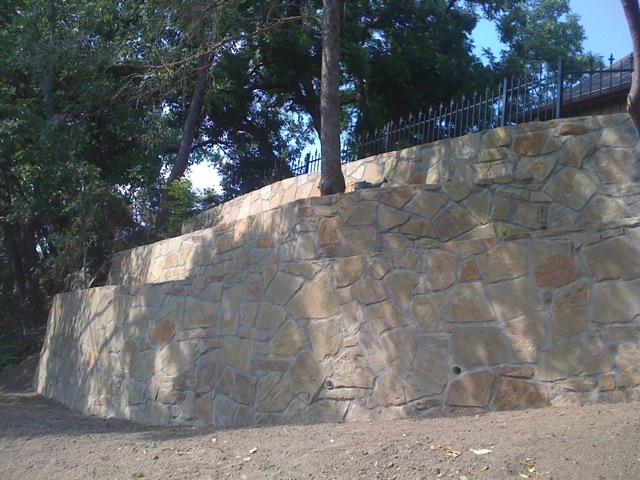 We are a very efficient and reliable landscaping company when it comes to Retaining Walls in Denton, TX. You can trust us to do the job right the first time because we have been in the landscaping business for decades and know what we are doing. We will help you design Retaining Walls in Denton, TX that you will be proud of and that will last for decades. Our technicians are highly trained and have the skills and expertise to build your wall with great precision and accuracy. We offer top quality services that will not be surpassed by any of our competitors. You can count our crew to work with you so that your wall will be perfect for your space. Plus, you can rely on them to do an exceptional job. Our technicians are the best in the region and will not be beat. You can trust our top-rate crew and can trust that your wall will be built with high-grade materials that will withstand extreme temperatures and various elements such as snow, high winds and rain. When the job is done, we guarantee that your wall will be well-built and will not crack, split in the middle, lean over or to one side and will not bulge or topple over. If you are looking for an interesting and efficient way to improve the appearance of your yard, contact us today to setup an appointment. When it comes to Retaining Walls in Denton, TX, we are the best in town.